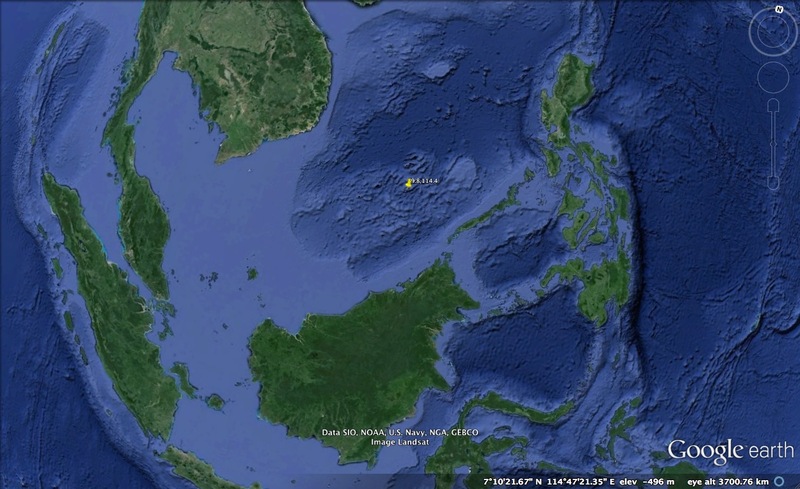 There seems to be a recent update to Google Earth,– apologoizing for over-reliance on this dubious source — the ocean between Vietnam and the Phillipines, the South China Sea. At least, I have not seen this much detail on earlier visits to the site. There now is clearly in evidence what we have corresponded about earlier in the Spratly Islands (plural Spratlies uncommon), which are contested by at least half a dozen nations bordering the S China Sea, as well as the U.S. who claim this is international territory. The reason is that the islands are oil-rich. The topic I am referring to is the Australasian tektite impact crater long rumored to be in this region. Because of ongoing oil drilling efforts — presumable efforts, I know of no specific news although it probably is out there — it is unlikely that specifics are easy to locate. Anyway, a multiring circular to oval impact structure is now clearly evident on the latest Google Earth updates. The diameter is about 175 miles/ 275 km, i.e., gigantic as expected from the large tektite strewnfield (BTW, that’s a Germanism, Streufeld, as my daughter recognized immediately when I told her about it). Also, there was a total regional extinction event that in particular wiped out the human population, early members of a race related to the Melanesians and to people living in India and West to Aden, but absent between Rangoon and Melanesia/ Papua New Guine. This race probably made the lithic industry that Mike Morwood et al discovered on Flores Island that’s 1 Ma old. The much later Homo Floresiensis (“Hobbits”) probably are descendants as are various so-called pygmy races including Andaman and Flores Islanders, and probably the Ainu — speculating like crazy but not insane, adding 2 plus 2 and getting four. The age is known very precisely at 780 Ka, for the strewnfield, not the crater — this may be known to the oil men in the Spratlies. The precise agreement with the Brunhes – Matuyama geomagnetic reversal was proven more than 10 years ago using Chinese loess sequences. 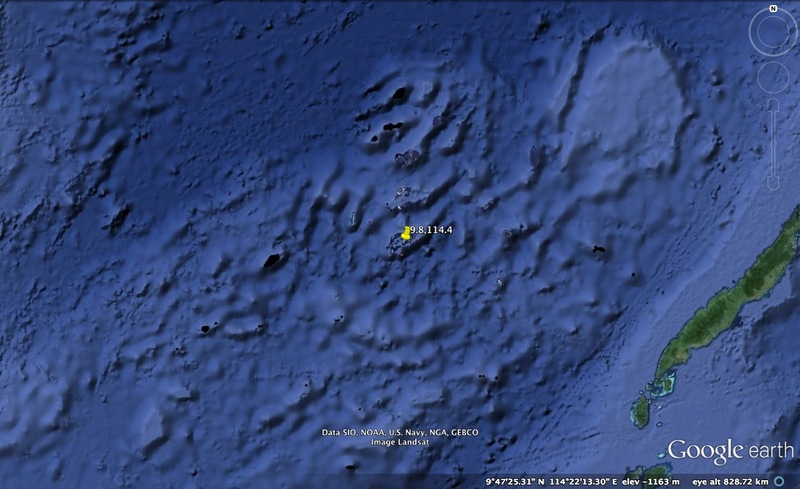 The 275 km impact structure is centered at an atoll called Union Reefs, or Union Bank, map 9.8,114.4, and this may well have arisen on the top of the central rebound uplift. I attach two Google Earth images, one narrow view, one wide view. The wide view shows the crater to be on the SE Asian craton, sedimentary rocks. If in this wider image you examine the Spratlies, something extremely dramatic and illuminating emerges. See that big blob of shoal to the NE of the crater? This is called Reed Bank (as G E will reveal in close up, and I have known for the longest), so it must be close to the ocean’s surface. Also, see the embayment to the SW of crater, again shoals, and finally the linear streaks SW to NE from the embayment to the crater and up to Reed Bank. Evidently, as the impact happened on or near the continental slope into Jurassic sediments, the entire slope collapsed, as would be easy to happen, and slipped way toward the NE, with Reed Bank a broken-off piece of near-shore shoaling. — This also may explain why there was so much tektite stuff hurled upward . . .
A very similar event is known to have happened in the N Atlantic W of the Outer Hebrides, vnear the Far Oer Islands map 60.0, -5.0 with broken-off pieces on G.E.